Guts is a tormented soul that has gone through a lot since his birth. He was raised among mercenaries with an adoptive father, Gambino blaming him for all his woes and wishing the boy had died. It didn’t help that Guts was raised on battlefields and that Gambino sold him for one night to a man. This greatly affected Guts and lead him to be distant from all for a long time. Things changed after being forced into the Band of the Hawk by their leader Griffith. Guts was harsh at first and intent to leave. 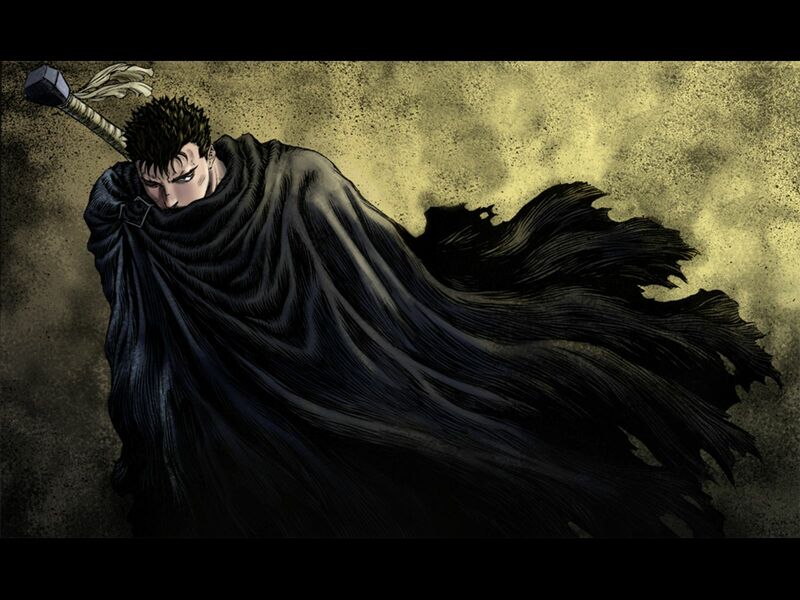 Guts only trusted in that of his broadsword as through all he had been through growing up. The sword had never betrayed Guts and was always there to protect him. He gradually found his place with Griffith taking him as best friend. Many soldiers gave praise to Guts in years to come. Guts held true to his namesake as he never backed down for any reason or for any one even when he had to go up against the legendary immortal Nosferatu Zodd. Judeau, Pippin, and Rickett became unofficial sidekicks as they urged Guts to interact with others. Soon many looked up to Guts as they did to Griffith. He also enjoyed bucking heads with Caska, the only female of the group. They had a love-hate relationship for the longest of time. 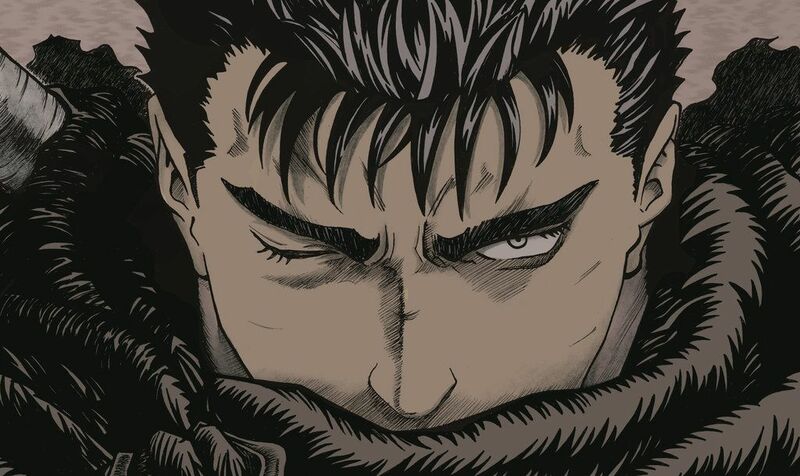 Guts also began to idolize Griffith because of his determination to become a noble, a seemingly unreachable dream that Griffith managed to achieve. It was during a mass slaughter of men that Guts had an epiphany of his own life and had decided in the moment to find his own dream. Though after the group nearly disbanded Caska finally acknowledged Guts feelings for her. Guts began to center his actions around Caska and was briefly doing things to help her out as acting leader of the Hawks. He also realized the Band of the Hawks was what he truly desired as they brought a sense of family. It all changed upon finding Griffith. Current times are set two years after Guts and Caska survived the massacre of the original Band of the Hawks. Guts became cold and unforgiving in nature. He cared little of bystanders and normally saves people on a whim and normally to use them if necessary during combat. Revenge rules his mind upon dawning the mantle of the Black Swordsman. Though all the rage, and madness he displays is a cover for the sorrow he feels from the betrayal of a friend, and lost of those he started to hold dear. Eventually after failing to kill the God Hand on a second encounter Guts refocussed his efforts to the mentally distraught Caska. Guts travels with her well being taking priority and allows an unorthodox crew travel with him to keep her safe when he cannot while caught in the midst of battle. Many believe Guts takes his punishment as being reckless. None realizing that Guts lets himself get injured so others don’t have to. Guts rarely cares when people talk bad of him as none know what he has gone through in life. Guts is a struggler in the truth of all things. He has defied fate from the surviving his mother’s death to being branded a sacrifice and meant to die. Guts lives bringing a situation of despair to that of a miracle with his determination and resolve to never give up. His name is Guts and he earned his name from the manner in which he was found. While still in his mother’s womb, his mother was hung. He was born from his mother’s corpse. Guts was then found by a woman named Shisu in the after-birth and decay of being born from a corpse. Shisu later on adopted him as her own. By the time he was three years old Shisu had died from the plague. With no role-model or parents to look up to, Guts turned to Shisu’s husband, Gambino, for support. Gambino wanted nothing to do with the young boy, so he just put him to work. As a mercenary Guts was useless unless he could fight, so Gambino taught him to fight starting at the age of three. With no small swords around Guts had to fight with a sword much larger than he was. When he grew older, instead of growing into the sword, the sword grew as he grew. By the time he was a full grown adult he was swinging a 6 feet long, 1 1/2′ wide sword that was not even sharp. After Gambino was killed at the hands of Guts, he went on from battlefield to battlefield as a mercenary for a few years. He got his big break after killing Bozuso the thirty man killer. He was then forced to join the Band of the Hawk after losing a duel to Griffith the Hawk’s commander (his first of only 2 battles that he has ever lost). Guts and Griffith grow to become equals though, and soon enough he became Griffith’s right-hand man. Guts keeps his word in remaining with the Hawks but rarely acts like one. Guts likes to be overwhelmed by enemies and rarely anyone has a weapon that can match the broadswords he likes to use in combat. Guts remains forever reckless in each encounter relying on his wits,reflexes and sheer luck to prevail. Griffith always takes Guts nature into account when planning his strategies. Caska dislikes this trait of Guts as normally it leads to Griffith having to bail Guts out of trouble every now and again. During one confrontation nothing seems to be going right for Guts and the others. A single man seems to be keeping their forces at bay and it gets under Guts’ skin. So defiant as ever he goes to see what is going on. Guts finds a very bizarre man known by Rickett as Nosferatu Zodd the immortal. Guts normally fearless is gripped by it for the first time since his youth. Guts faces Zodd and learns he is no mere human at all. Still Guts strove to hold his own. Griffith arrived in learning Guts ran in alone. Together they were able to deal seeming crucial damage to Zodd in severing an arm. Until the beast just put the arm but on. Griffith nearly got killed as Zodd decided to leave. He wanted Guts to grow stronger so he could enjoy a glorious battle later on down the road. Caska rushed to Griffith scolding Guts for letting it happen. Guts ends up being Caska and Griffith in escorting members of the royal family. He is uneased as Caska still will not talk to him since the Nosferatu Zodd incident. Travesty strikes again with an assassin trying to kill Griffith. Luckily the White Hawk was saved by his Behelit, a luck charm always carried with him. Griffith later speaks with Guts to determine who was plotting is demise. Guts is requested to eliminate Duke Julius, General of the White Dragon Knights. Guts goes stealth for this task and cannot allow anyone to see his face as a commander in the Band of the Hawks. Guts slips in very easy to strike down the general in one blow. Unfortunately the general’s son finds them. Guts reacts by instinct to kill the boy. He remains until the kid dies,mortified at what he has done. Guts is quick to flee as an attendant draws at the corner. Several guards are killed in Guts’ escape before one manages to hit him with an arrow. Guts finds way into the sewers to rest and past out. He has a nightmare of Zodd and himself becoming a monster after killing the boy. Guts seeks Griffith to let him know the results of his assignment. Caska stops Guts outside of a noble party. Guts overhears Griffith speaking to Charlotte about what friends mean to him. Guts is left standing in the shadows with Caska. Soon afterwards it is time for battle. Guts moves through the enemy to aid Caska who is confronted by the enemy commander Adon. Guts has no trouble in defeating the man but has to save an ill Caska. Guts is too late in pulling Caska from a cliffside and goes over with her. They survive with Guts taking the brunt of the damage. He tends to Caska until she wakes. Caska tries to kill him in a fit of confusion and is pinned by Guts. Caska calms and reminisces of a time before Guts came. She shares her opinion of Griffith, and jealousy of Guts. Both are alert as enemies are closing in on their location. Guts and Caska attempt to flee only to find Adon has hunted them down with 100 men. Guts keeps Caska from harm and allows an opening for her to escape. Guts remains taking on the mercenaries on his own. None can strike him down or do enough damage to slow the berserker. Guts fights through the entire night causing Adon to flee. Guts takes heavy injuries by the time he is done and sits to rest in a field of 100 dead corpses. Guts survived his suicidal battle with Adon’s mercenaries. This brought fame to Guts and also got him favor in the eyes of Caska, who he was initially protecting. Although Guts accomplished a seemingly impossible feat he still felt his deed was mediocre. Guts had been comparing himself to Griffith and now Caska as both had a strong attachment to their dreams that brought others that offered aid to reach that goal. Guts keeps it to himself but now wants to leave and find his own dream. Guts would not just up and depart like a bandit in the night. He decides to at least remain until the end of the 100 year war between Midland and Chude. He knew Griffith had the talent to do this. It came to a point where Midland was at the disadvantage. The strongest legion of Chude remained undefeated. They were the Purple Rhino Knights led by General Boscne. Other commanding knights of Midland felt it now hopeless to advance any further. Griffith seized this opportunity and vowed he could prevail. The king favored Griffith and decided to put faith in him. During the final battle Guts leads the Hawk with Griffith and Caska. The enemy are aware of Guts as the legendary 100 manslayer and commander in the Band of the Hawks. Unfortunately this also draws the attention of Boscne. Guts is excited in this clash. Boscne is the first man to give him a challenge in a long time since Griffith (Nosferatu Zodd is not a man but something far worst). All was going well until Guts sword broke in the middle of combat. It had lost durability after locking swords in killing the hundred men only weeks earlier. Fellow hawks rush to Guts aid despite his warning only to be slaughtered by the bloodthirsty Boscne. This was the opening needed by a dark figure atop a cliff. A familiar massive sword is thrown at Guts’ feet. He doesn’t hesitate to take it to arms. This weapon easily breaks Boscne’s huge axe. Guts continues to decapitate Boscne and his horse. The Chude army basically surrendered as Caska had taken Doldrey Castle, the enemy stronghold from the rear by killing Adon. Guts goes to find Caska still recovering from a shot of poison by the treachery of Adon. They are both in admiration of Griffith as he kept good on his word and has ended the 100 year war. Celebrations await the Band of the Hawks in returning to Wyndam Kingdom. Guts has even more fame in killing General Boscne, atop of the hundred men. Guts is forced out his usual attire and gets a lot of unwanted attention from nobles. Caska steals him away as she is in the same boat. Guts learns Caska shares his views and didn’t feel comfortable unless having armor on her back and a sword in hand. Both overhear Griffith has been promoted and ordained commander of the White Phoenix Knights. Joys quickly turn to despair as Griffith’s drink is poisoned. Guts ends up going stealth once again. He greets the one tasked to taint Griffith’s drink. It turns out a pack of nobles sought Griffith’s end from the beginning. Griffith was aware and had Guts alone in on the plan. Now all was as it should be and Guts decided it was due time to leave. Caska was aware and rushed to stop him. Judeau, Pippin, and others also catch Guts. Corkus is the only one wanting Guts to be gone and vows to kill him if they meet later on down the road. During escorting Guts to leave Caska went to wake Griffith. Guts stood as Griffith refused to let go of a vital member of his crew and best friend. Guts revealed to all he had now far surpassed Griffith in terms of skill. Griffith was left in dismay on a snowy field. Guts left with Caska calling out to him for the first time. Guts spends a few nights alone trying to get use to being on his own again. He had adjusted to having comrades to rely on for 3 years. Those memories are brought to a halt in face of the Skull Knight. Guts attempts to fight him but the foe is omnipresent in his movements. Guts stops as the armored foe appears out the darkness several feet away when he was just behind Guts. The Skull Knight warns Guts to be cautious of the coming eclipse as it will herald great travesty. The Skull Knight shares his belief only one such Guts will be able to survive the future and defy fate. Time passes with Guts now a wandering swordsman. He seeks out the best to keep sharpening his skills. This brings Guts to an exhibition tournament where he intrudes upon to contestants. He decides to face a masked figure of the Kushan known only as Black Horse, the other is a poser that claimed to be the Crazy Killer, that killed 100 men (which Guts had accomplished) in the war of Midland vs Chuda. Guts displays great agility in evading the movements of Black Horse. The sponsor is amazed as Guts won in a single swing of the sword. He offers an job as a mercenary. Guts turns it down no longer walking that path. The sponsor is let down and hoped to get the reward for seizing the Band of the Hawk and its leader Caska. This draws Guts full attention as he learns Griffith was imprisoned and deemed a traitor of the country along with those who served under him. Guts travels all day to the rumored location of his former comrades. He arrives in time to save Caska from Black Horse. Guts apparently took care of the other foes and the hawks rejoiced in the return of Guts. Caska has no words and leaves for her tent. Guts learns Griffith got very depressed around the time when Guts left. None are aware what Griffith did but all of Midland is out to kill the Band of the Hawks now. Judeau reveals plans to find and rescue Griffith before fully reforming their numbers. Guts tells of reaching new levels of might in his absence and is willing to help. Judeau pulled Guts aside to reveal Caska was once calling out for him in a dream. He decides to talk with her only to be attacked. Caska blamed it all on Guts. She tells that Griffith lost all composure the day Guts left. Guts lets himself be impaled and justifies his actions. Caska tries to kill herself and Guts saves her life again. This finally leads her to see that Guts cared for her in a way Griffith never did or would. Guts ends up revealing his own turmoils and why he is so distant from everyone. This draws Caska even closer as they have both shared secrets with one another. Guts is with Caska in rallying the hawks for their first mission in a long time, to save Griffith. The majority of the force is left to secure the escape route. Guts teams with Caska, Judeau, Pippin, and Corkus. Guts discovers Princess Charlotte is the spy aiding the hawks with information to avoid capture and now to find Griffith. She leads the team to the Tower of Rebirth, constructed long ago to imprison pagans that worshiped satanic gods. Guts remains silent as Judeau and Caska debate over the princess coming any further. The princess declares she had come to be with Griffith and will progress on her own accord. She also became a burden and Guts had to carry her on his back the rest of the way. The princess started revealing the origin of Midland and the Tower of Rebirth. Guts discovers the identity of the Skull Knight as the first emperor some thousand years ago. Soon Guts and the others reached the bottom of the tower. He found Griffith maimed on his cell floor. Griffith no longer resembled the man he was at all. Suddenly an inquisitor locks everyone inside with Griffith. He boasts on breaking the White Hawk month after month until he was silent. This ignited the berserker in Guts. He easily pierced through a 4 feet thick door killing Griffith’s tormentor. Guts proceeded to climbing the tower and killing anyone in his way. Many tried to flee but an enemy commander ordered all to remain as it was a single man. He got killed with them all.Once outside the tower another force await with the withered king. Guts resumed to his berserker state killing at least forty men. Caska helps killing one guy. The king calls a halt in fear of Charlotte’s welfare. Guts and others are allowed to retreat. The king sends for the Baakiraka, an abnormal gang with features resembling Black Horse. Guts is now exhausted and tended to by Caska. Griffith watched in silence carried at Pippin’s back. The Baakiraka catch up and ambush the group. Only they injure Charlotte which was not suppose to happen by any means. The Baakiraka claim only to want Charlotte and she is let go with her maid. They then resume their attack only to be defeated by Guts and the others in a team effort. A surviving female of the Baakiraka ignites a fire consuming all the sewers. Guts and the others escape as Pippin caved in the walls behind them. The team find shelter with a small family still loyal to the heroes of Midland. The agenda was now to regroup with the remaining hawks left in a forest escape route and return to their campsite. Unfortunately a day later the king dispatches his personal underhanded group, the Black Dog Knights. These men quickly catch up to Guts and his crew. He and Caska see those that gave them shelter were dismembered and impaled on sticks for display as the Dog Knights rode. Guts remained to face them all but this time he wasn’t alone as Pippin was at his side. The two began to slaughter but it wasn’t like any other fight. Guts realized no matter how many guys he killed the enemy didn’t waiver at all. Then came Wylad, leader of the Black Dog Knights. Guts and Pippin fight cautiously as Wylad blocks their blades with one hand. Luckily the two were a diversion from Caska setting an explosive trap at a bridge. Guts and Pippin retreated as the explosion separated them from the Black Dog Knights. Guts and the others watched Wylad easily clear through another trap in a valley. He alone knew that Wylad was no ordinary man and feared he may be like a person he met a year ago. Guts challenged Wylad knowing others would be killed if they were to act. After a long duel Guts bare witnessed as Wylad transformed into an ape-like beast. Guts struggled as he did with Zodd the Immortal. Guts takes brutal punishment but goes berserk once Wylad threatens Caska. Guts drives his sword into Wylad’s neck and the monster falls. Guts and the rescue team meet with comrades in the forest. All rested up before rejoining their reserve team at the campsite. Caska scolds Guts for being reckless as every even in facing something beyond explanation in Wylad and his demonic transformation. Guts also spends some time with the broken Griffith. He tries to reassure Griffith he will fight again one day. Wylad strikes again terrifying all but is near death. Wylad targeted Griffith this time and wanted him to use the Behelit charm to summon the God Hand. Guts is helpless with Wylad threatening to kill Griffith only to learn Griffith lost the Behelit. Guts is shocked when a larger monster shadowed Wylad. It is Zodd and he saves Griffith for unknown reasons to Guts. Zodd finishes Wylad off by breaking his back. Zodd addresses Guts of a coming eclipse and hopes he is prepared. Guts is enraged as he got the same onimous warning from the Skull Knight earlier when he left the Band of the Hawks. This event leaves the mercenaries broken in spirits. Guts plans to leave again and take Caska with him. Though she feels unable to follow her desire as leader of the Hawks now. Guts learns the Hawks now see him as their symbol of hope. Many offer to leave Caska and Griffith feeling they could survive with Guts leading them. Guts finally realizes the feeling they gave him was what he was searching for all his life, the sense of brotherhood and a family. Guts tries once more to convince Caska to leave Griffith and let Judeau and others tend to him. Griffith acted on eavesdropping and built the strength to flee them all. Guts pursues him without a second thought leaving his sword and armor behind. Soon Guts finds Griffith staring at the coming eclipse in the sky. Guts also tries to make sense of a vast legion nearing Griffith from the horizon. Many believe another faction of the Midland Army had been sent after them again. Only Guts knows it is something far worst.Guts reaches Griffith to discover the Behelit found way back into his hands but looked nothing like it did before. This is when the background changes and all of the Hawks find themselves in an alternate dimension of some sort. Guts with Griffith faces the Four Angels of the God Hand. They reveal Griffith is ordained to be the fifth and must sacrifice those he love to ascend. Guts is in dismay as Griffith submits to the God Hand and began his transformation into one of them. Guts is branded along with Caska and everyone else present at this horrid gathering of demons set to feed on human flesh in a grand feast. Guts alone has the might to fight off the monsters at every turn. He spends a great deal of time trying to find Caska, Judeau, and the others. Guts finds his favorite subordinate Gaston, but he dies before Guts eyes. He resumes to fight until finding Caska had been caught by the demons. Guts goes berserk killing all in his path until the demons focus on subduing him. The angel Slan takes strong interest in Guts for his fiery emotions. Guts and Caska are both tormented by Griffith upon emerging as the angel Femto. Before they are killed the Skull Knight breaks in the dimension to save Guts and Caska. Both are taken to Rickett that escaped the massacre of the reserve Hawks at the campsite. Guts and Caska are taken to Godo, where Guts spent his time training. He has many flashbacks of his time in the Hawks and how everyone was now gone. Guts wakes to discover his right eye blinded and his left arm gone as he hacked it off while trying to escape demons to save Caska. Guts is frantic and ignored injuries to find Caska. He finds her and she is now emotionally scarred and suffered a mental breakdown. Guts is overwhelmed and flees her with grief and turmoil mixing inside of him. The Skull Knight comes and reveals Guts is now a branded soul. Demonic spirits came to posses Guts but he refuses to accept anything dealing with fate. Guts vows revenge on the God Hand which impresses the Skull Knight. Godo and Rickett decide to help Guts. Rickett devises a prosthetic arm that acts also as a cannon. Godo makes a number of swords but Guts finds way to Godo’s prize Dragonslayer. Godo allows Guts to use the massive weapon no other man had been able to use in full. There was nothing that could be done for Guts lost eye, and he now uses the brand on his neck as an alert sense towards the demonic Apostles. This is the point where Guts decides to live on as the Black Swordsman, and travel the world killing Apostles until led to the God Hand and Femto aka Griffith. This point treads a little after the start of the manga. Guts has killed the demonic female apostle that ate Corkus. He ends up saving the life of Puck to get information of the local Apostle deciding to rule an unnamed town. Unfortunately Guts is caught and imprisoned to be tortured and questioned by the mayor. Guts had killed men serving the local Apostle and learned the mayor and others very fearful of him. Nightfell with the Snake Lord deciding to go on a rampage. Puck returns after abandoning Guts to free him. Guts made his way to the battle to find the Snake Lord killing innocents. Guts proceeded to kill those in service of the Apostle and fights the Snake Lord himself. He had the upper hand until the Snake Lord revealed his demonic form. Guts is thrashed around with the Snake Lord talking down to him as being a weak human. Guts uses his cannon to turn the tides and shows the Snake Lord who was really weak and leaves him begging for mercy. Guts moves on as the night was young. Only to draw demonic spirits upon a grandfather and his granddaughter. Both were killed by the demons as they were in company of Guts, the living sacrifice. The brand on Guts’ neck signifies him as a meal for all demons as per law of the God Hand. Guts has other plans as this brand also alerts him by bleeding whenever a demonic presence is near. So Guts only finds rest during the day as demonic spirits fade in the coming of daybreak. Guts ends up in a community during the execution of those being marked as pagan worshippers. He finds the Count, another Apostle but had ruled over the people for a long period of time. Guts begins killing the Count’s men but there are too many. He is aided to escape by a former advisor of the Count that wants revenge for having his legs chopped off and his family slain. This is also where Guts learns of the Behelits, devices to summon the God Hand. Griffith carried one around his neck for the longest of time. Guts ends up being attacked by Captain Zondark, a guy maimed by Guts in the earlier attack on the Count. This time Zondark has minor demonic properties bestowed to aid in exacting his revenge. Guts finds out the Count gave the captain some regenerative capabilities. Guts held off Zondark until the fool brought the entire hideaway upon himself. Somehow the advisor was caught and Puck begged Guts to save him. Guts didn’t and got a visit from the Demon Fetus of Caska. It visited him before and seemed to be following him. Guts seems disturbed by this creature rather than killing it like he does every other demonic apparition. Guts ends up having demons try to takeover his body and has to force them out. Not long after that is when Zondark returns for more. This time Guts battles him in full to kill the deformed man once and for all. Guts enters the domain of the Count to kill a lot of men before facing Geriko, second to Zondark but no demonic powers either. Guts kills him in a swing of the Dragonslayer. He advanced forth to face the Count at last. The Count wasted no time and transformed from the beginning revealing itself as the Apostle that killed Pippin. Guts actually has a tough time against the Count and is knocked out. Puck and Theresia, the Count’s daughter, end up being essential to Guts’ survival. Theresia never knew of her father’s pact with the God Hand and his true form horrified her. Guts decided to use her as human shield showing how low he would sink to gain the advantage. The cannon was used once more and swing of the Dragonslayer sealed the deal. This is when the Count showed his fears in facing death. Guts once again began torturing the Apostle in his defenseless state. Unfortunately the Count noticed the Behelit that fell from Guts’ person during combat and used it. Guts came face to face with Femto and the other God Hand once again. The brand on Guts neck sent tremendous pain that was suppose to immobilize all sacrifices in presence of the God Hand. Guts not only moved, he went in to attack but couldn’t bare the pain when up closer to Femto. Guts was knocked out again and the God Hand went on to cox the Count into sacrificing his daughter to save his own life. Puck came to heal Guts as the Count finally decided he couldn’t kill Theresia after reflecting on all that happened to him. Guts was nearly caught up in the whirlpool of demons taking the Count away upon his death. Guts failed to kill any of the God Hand and now they were gone to be anywhere in world.